Tennis Grass TAIJUN / China (PRO COMFORT). Tennis Grass SALTEX / Finland. 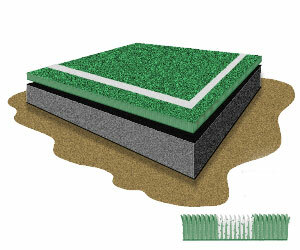 Synthetic grass surfaces combine the advantages of all- weather, clay, and natural grass tennis court surfaces to provide an ideal cushioned tennis court. They also have proven user-friendly qualities such as optimum turn, slide, foot release characteristics, superior traction and some of the best force reduction properties for tennis playing surfaces.